Here’s a bit of a blast from the past for you all – in more ways than one. The Age of Egypt slot machine by Playtech is a bit of a dated offering now from one of the industry’s most respected designers. The action itself takes place in the time of Pharaohs, pyramids, and hieroglyphs. Although it is an older title, there is still a lot to enjoy about the Age of Egypt slot machine. We particularly liked the lucrative bonus stage and the massive top jackpot. However, we felt the artwork and gameplay features let the title down. Absolutely made for the high rollers. There are few slots that let you bet £10,000 on each spin. Even though this won’t matter to most, for some players such high betting limits make all the difference. Lucrative bonus features. We love multipliers on free spins and find the 3x one included here to be most generous. Massive return-to-player rating. This makes the Age of Egypt slot ideal to spin through a casino bonus on. Huge top jackpot. On some machines, matching five-of-a-kind will award a few hundred quid, if you’re lucky. Here, it could be lifechanging! Weak artwork and animation. This is to be expected given how old the Age of Egypt slot machine is these days. Even still, it wouldn’t have been that breath-taking back then either. Poor side games. The features on the Age of Egypt slot machine are boring by today’s standards. They might be lucrative, but they don’t do much to excite players! 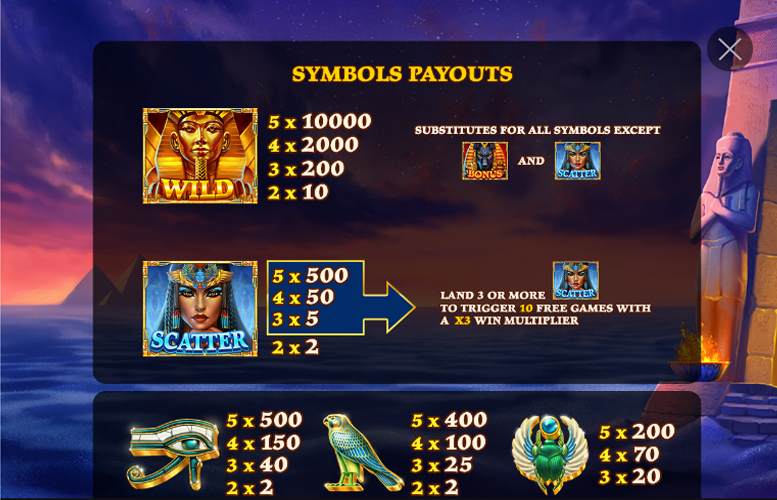 The top jackpots on the Age of Egypt slot machine are all awarded for hitting five-of-a-kind of the high value symbols along one of the 20 active win lines. These symbols have been inspired by the world of ancient Egypt and if you think back to your primary school history classes, you’ll probably recognise one or two of them. “Wild” Burial Mask = 10,000x the line bet. Queen = 500x the line bet. Eye of Horus = 500x the line bet. Bird = 400x the line bet. Scarab beetle = 200x the line bet. 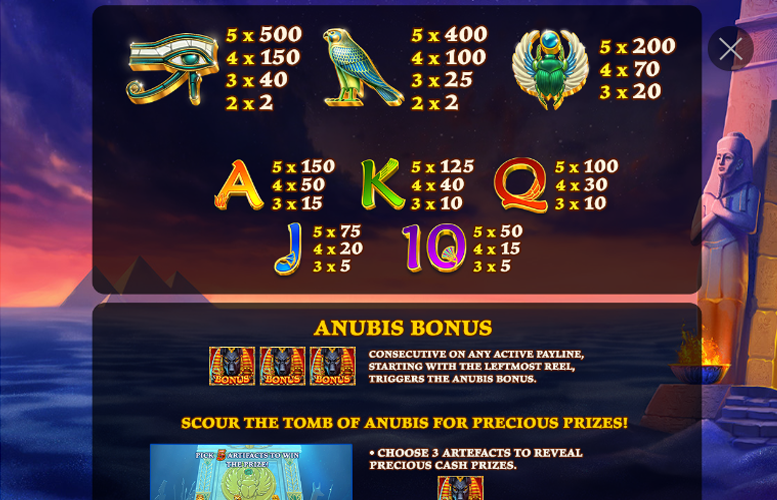 Landing three Anubis “Bonus” symbols in consecutive positions down a single pay line will activate the Anubis Bonus. Players must scour the tomb of Anubis to unlock the god’s treasures. They are then invited to open three of the artefacts. If the bonus feature is triggered with either four or five “Bonus” symbols, then four or five artefacts may be opened respectively. Landing three or more Queen “Scatter” symbols anywhere on the reels will trigger 10 free spins. All winnings awarded during this mode will be multiplied by three before being awarded to the player too. 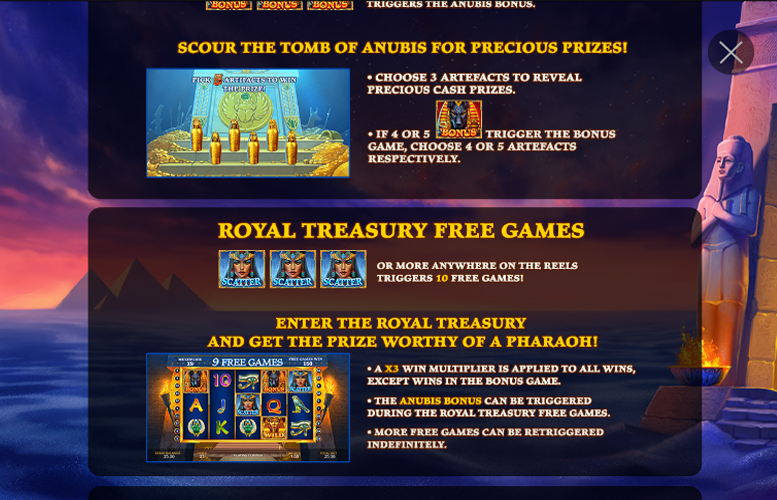 What’s more, the Anubis Bonus can be triggered during the free spins and more free games can be retriggered indefinitely. King = 125x the line bet. Jack = 75x the line bet. Ten = 50x the line bet. 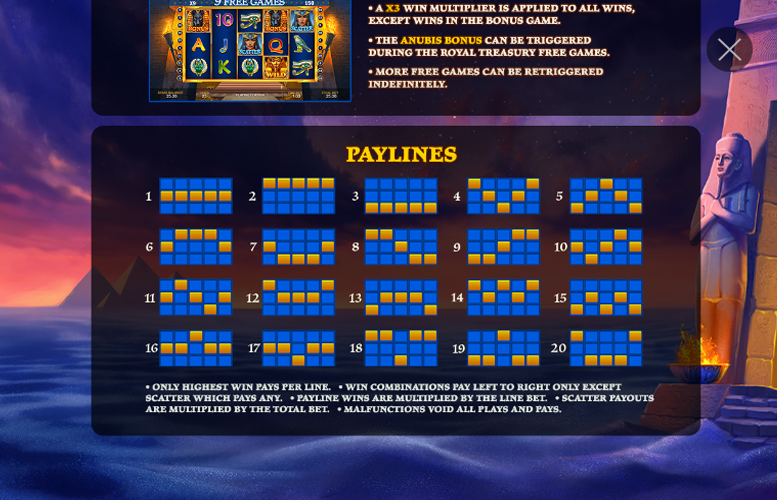 Betting on the Age of Egypt slot machine from Playtech is spread between one and 20 win lines. Meanwhile, players can also change the amount bet on each of these. There are various increments ranging from just 1p right up to £500. This means that with all the figures set to their minimum, the lowest wager per spin on the Age of Egypt slot is just 1p. Meanwhile, with everything maxed out, the highest possible bet per spin is a massive £10,000. This is probably the highest single spin amount we’ve ever encountered! 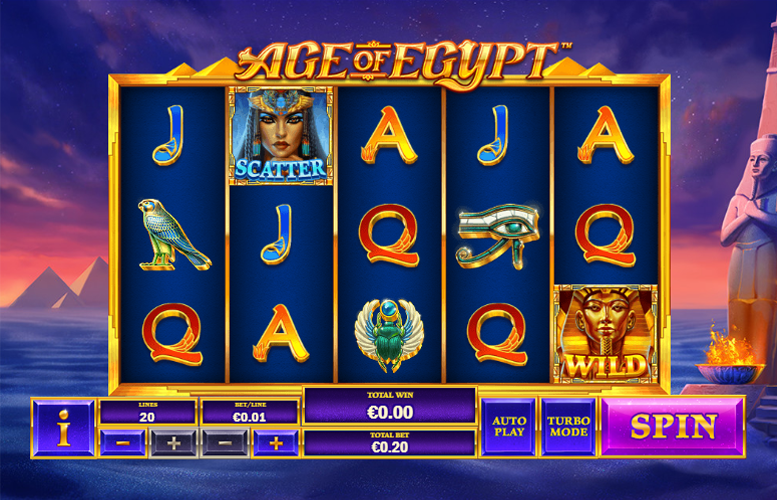 The Age of Egypt slot is a fundamentally sound slot machine for its day. It lacks a lot of the “wow” factor of modern games but for the serious player, it comes highly recommended. The title offers players a massive potential return-to-player rating (over 97%) thanks to special features like its free spins with a 3x multiplier. It also has one of the highest upper betting limits we’ve ever seen. If you’ve got millions to spend or a juicy bonus to grind through then this could well be the title for you. This game has a rating of 4 / 5 with 682 total reviews by the users.